It is a known fact to all of us that grid is the most widely used component in enterprise application development area. Nested Grid is a concept nesting a grid inside a grid. It is also a common use case in enterprise application development. The most famous example is to show the list of orders and the corresponding list of items glued to each of the order. Nested Grid is the most suitable component to show such data more intuitively, where the user can see Order Items of a given order below the Order itself without navigating to other pages/screens or pop up. In this article, you will learn how to construct a nested grid to show order list with the corresponding item list in a PrimeNG enabled Angular application. This articles also covers steps to create PrimeNG based Angular app. If you already know how to do this, while reading you can skip the corresponding steps. By the time you finish reading this article, you will get to know the steps to construct a Nested Grid depicted below. I am covering the same example i.e. orders that we discussed in the previous section. Run npm install command in the terminal from the project root directory, which will install PrimeNG and font-awesome npm packages into your project. 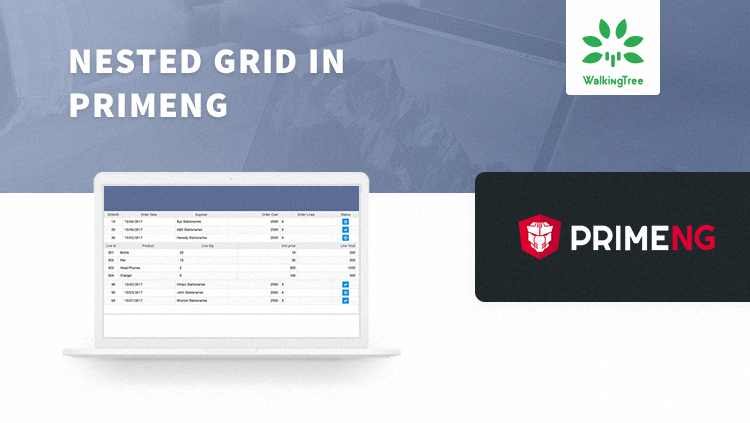 With this your angular project nestedgrid has got PrimeNG library, Now you can use PrimeNG components in your application by importing the required Modules and Classes. Create new NgModule for Orders, which will have the new component that we are going to develop and its related service. In order to develop this component we are going to use DataTable component which is available in DataTableModule and Button component which is available in ButtonModule of PrimeNG, We have to import these two modules in app and orders module. Before building a DataTable component let us create the data for orders with order lines to render into the Grid, Save the data into a json file under asset/data folder. Now your service is ready! Define orders property in the component class which has been used in the p-table component as value. Run ng serve command in terminal and launch the application in the browser with URL http://localhost:4200. The current grid will only show Orders, In the data, we have orderliness as well. To show order lines we need one more DataTable configured with the orderLine columns. Add expandableRows property to p-table with value true, this will enable grid to expander column (column to show expanded icon and will expand the row by listening click on the column), Adding this property p-table will expect a ng-template of pTemplate type rowexapnsion to be shown on expanding a row, which will have access to the rowData. With this template added you have orderLiness grid in Order grid, Nested Grid is achieved. In this article, we have learned steps on how to create Nested Grid in PrimeNG enabled the Angular application. Hope this article will save a good amount of time for you when you come across this kind of need. The source code in the git is the old version of angular not angular6. You have to upgrade the project to angular. Article on upgrading the angular project to angular6 is in pipeline, you can refer that if needed. Yes swapping the tabs will work. Thanks for pointing this out, will update the article.